With racing moving inside the Wave, Muscat's new breakwater for day two of the Extreme Sailing Series, so eight races were held today in marginal hull flying conditions, with 2012 season favourites Groupe Edmond de Rothschild and Oman Air proving that their day one results were no fluke. Tied going into today's racing, the two teams jockeyed for the lead in the first four races today with race one going to Oman Air, Groupe Edmond de Rothschild then claiming the next two and Oman Air the fourth, before the sea breeze dropped allowing some other teams into the frame. With the course change to a reaching start and the wind dropping, Oman Air's team mates on The Wave, Muscat, steered by Britain's Leigh McMillan pulled back to claim two races, with double Olympic Tornado Gold medallist Roman Hagara scoring one bullet and the Ernesto Bertarelli-steered Alinghi claiming the final race of the day. However the end result is that after day two and 13 races sailed Groupe Edmond de Rothschild now lies just one point ahead of Oman Air, with a 12 point cushion now over third placed The Wave, Muscat. 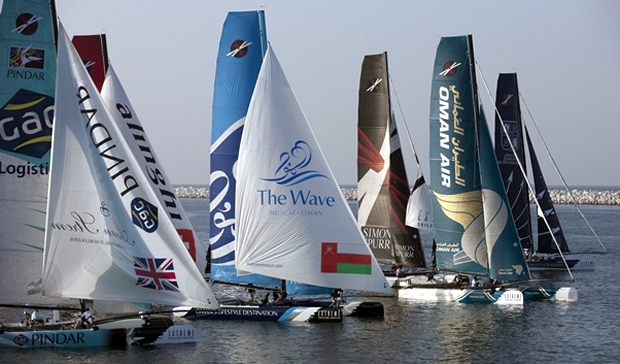 This might have been more were it not for Oman Air being OCS in one race and Groupe Edmond de Rothschild having been penalised in another for not giving room to The Wave, Muscat at the downwind gate. Of his first win in the Extreme Sailing Series, when he led the final race from start to finish, Alinghi helmsman Ernesto Bertarelli said: “We’re happy with the last race and winning it – to be positive in the debrief and look forward to tomorrow. I think everyone is going to win a race, I mean, the boats are fairly equal, everyone is quite good at what they do and the question is to be better than everyone else on average and we’re not quite there yet.” The Swiss team only just 1 point adrift of ZouLou driven by Loick Peyron in 6th place.